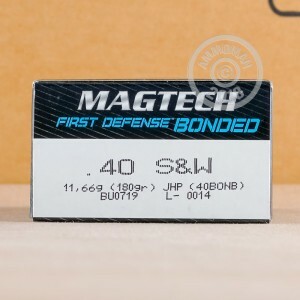 This .40 S&W ammunition from Magtech is a strong choice for self-defense use in firearms like the Smith & Wesson M&P, Glock 23, and SIG P229. Each cartridge in this box of 50 fires a 180 grain jacketed hollow point bullet at a muzzle velocity of 991 feet per second. 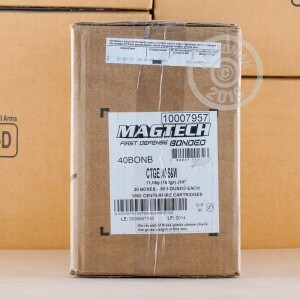 Magtech ammunition is loaded in Brazil by CBC, a major Latin American defense contractor that produces its own ammo components including non-corrosive Boxer primers and brass cases. 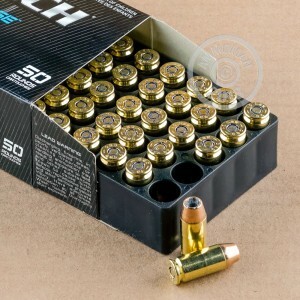 AmmoMan.com is a great place to stock up on ammunition for all your firearms. With free shipping on all orders over $99, we're rewarding you for buying big!